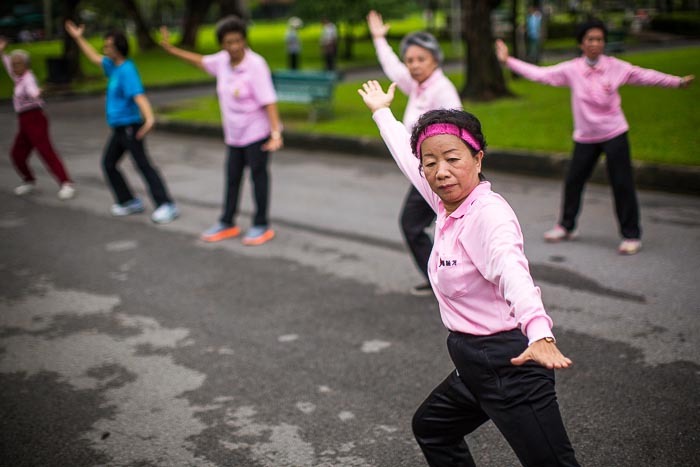 An exercise group works out in Lumpini Park, photographed with my 50mm f1.2 lens using f1.6. I carry a heavy bag full of gear so I'm ready for every eventuality. I don’t go out for a serious day of photography without two full frame bodies, a 24mm f1.4, 50mm f1.2, 100mm f2 and 200mm f2.8 lenses. I also carry a Micro 4:3 body with a 12mm, 20mm and 45mm lenses (equal to 24, 40 and 90 in full frame terms). The truth is though that most people make too much of what lenses to buy. They could improve their photography by really learning to use just one lens. There’s a lot to be said for keeping it simple. Jerome Delay, a photographer with the Associated Press, has been making remarkable photos from some of the most troubled places on the planet with just one camera and a 50mm lens. Working with just one lens forces you to really work a scene. If you want to see it differently you don’t just put another lens on the camera. You explore the scene with the lens you have. A 50mm lens doesn’t have the distortion that is common to many wide angles. And it’s much easier to carry just one lens and camera than a bag full of lenses and cameras. The New York Times wrote about Delay’s photography with a 50mm lens last year. It should be required reading for anyone who wants to buy a new lens.